I'm such a critic - an enewsletter critic that is. Of course, critiquing other newsletters is partly how I get better at my job. 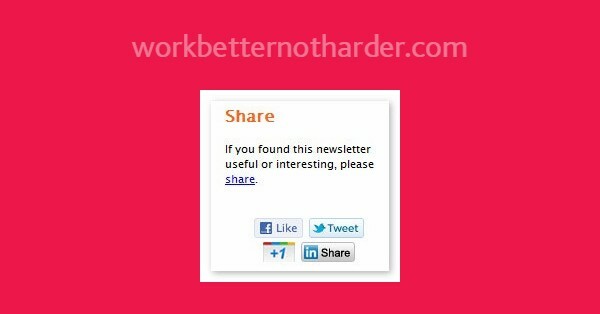 I'm often disappointed when I receive a newsletter or promotional email that doesn't give me buttons for easy sharing, especially when it's something I want to share. In many cases, with the amount of information to read these days, I will shrug and move on. I would have shared the information but the sender turned it into a job. Another job I don't have time for in my already busy day. How often do people shrug because they can't share your information easily? Think about your own activities, what encourages you to share? And how easily do you give up? Good food for thought and future implementation! Interestingly, I just did a survey for a website I frequent and many of the questions were regarding "sharing". If it is easy to pass along information, I know I will happily do it. I couldn't agree more, Cheryl. I have an article in my next newsletter (Thurs) that's about creating content that people want to share. Would love to hear your feedback on my suggestions because I bet you could add to it.